The need: A lot of data relating to udder health is routinely collected on farm. Analysis of this information could provide farmers with a comprehensive snapshot of mastitis control in their herd, and support management planning for critical stages of the lactation. What we did: The Harris Park Group developed the concept and specifications for the Mastitis Focus Report in 2006, and beta-tested the software programmed by Dr Mike Larcombe in 2007. A series of workshops across the dairy regions were conducted in 2009 to help service providers become familiar with the report. And in 2008 the report-writer software was made available online. 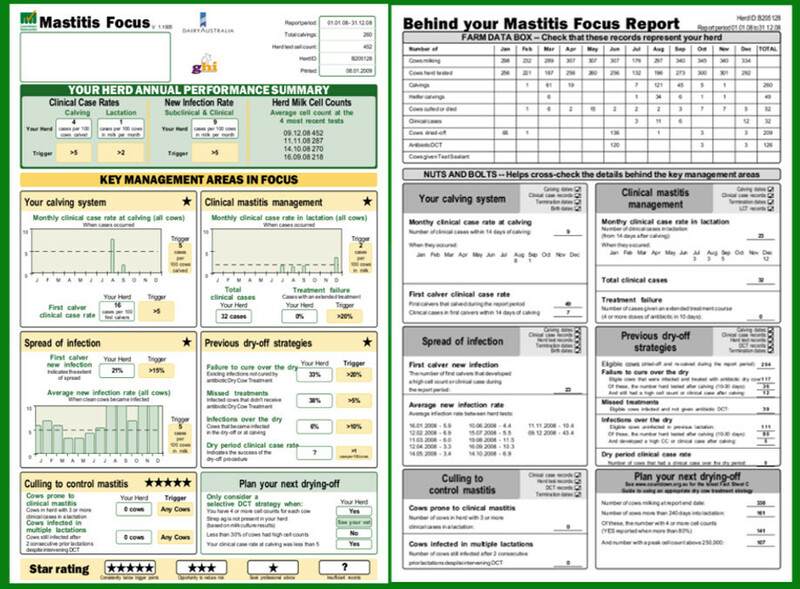 The Mastitis Focus Report is a sophisticated tool that uses herd data to assess the key mastitis management areas on individual farms. Dairy farmers can get the report on-line, through their herd improvement organization and through some herd management software packages. The Mastitis Focus Report has been subsequently adopted by DairyNZ with adaptations to suit their highly seasonal production system.